The first Goblins have made their way into the game and are now being playtested. While that’s going on, as always, we’ve implemented a bunch of smaller things from our todo. The most important one this week: Throwing Weapons and a bit of love for ranged combat in general. Also, Paul has been busy as ever continuing his visual rework. 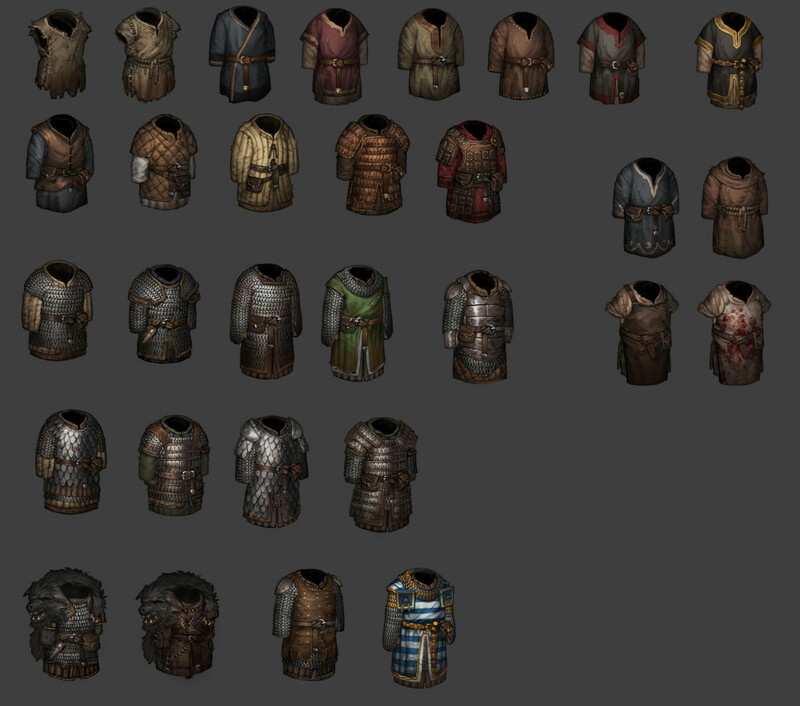 Wiedergangers and all armors in the game got a makeover! Let’s talk about ranged combat in general for a moment. There’s some things that work well already, such as the difference between bows and crossbows, line of fire and friendly fire. But then there is the issue of ranged combat, generally speaking, not having quite enough of an impact on how the game is played. Players seldom invest into the Ranged Defense attribute, as ranged opponents usually don’t pose enough of a threat, and using ranged weapons themselves is usually reserved for a token archer or two. To address this, we’ve taken several steps. First, view range for all units has been increased by one, and the range of bows and crossbows has been increased by one as well. This way we’re emphasizing the strength of ranged weapons and make for more situations where they can be of use, while at the same time making it easier to find enemies running. Second, we’re rethinking the place of throwing weapons in the game and introducing a bunch more. Here we go. Whereas bows and crossbows are best for long-distance ranged combat by ranged specialists, throwing weapons are supposed to be secondary weapons that can be used at least somewhat effectively by everyone over short to medium distances. That’s why throwing weapons get an accuracy bonus to start off but have their accuracy drop much more sharply than for bows and crossbows the more distant the target is. New throwing weapons are Throwing Axes, Javelins and – spoiler – two devilish Goblin throwing weapons. Crude Javelins, previously already in the game, are now an orc weapon again, as originally intended. Those throwing weapons are being handed out to some melee opponents as we speak. Not to everyone, of course, but Goblins are very fond of them as they synergize well with their other tools, and Bandit Raiders may also throw an axe your way every now and then. Even a few Young Orcs may now carry javelins to throw before a charge. If the only alternative is charging into your spearwall, your opponents may now opt to just pelt you from afar and punish your static defense line. With ranged weapons now more common, Ranged Defense should also become a more important choice on level-up and in choice of shield for keeping your Battle Brothers safe. It’s still not a must-have, but it makes a difference – and very specialized builds, such as the famed Nimble Swordmaster, now come with a clear weakness that can actually be exploited by the AI. Continuing with the visual makeover we announced last week, Paul has given the Wiedergangers some attention. Not only have they received some polishing, they now also sport their very own hair and beard styles fit for half-rotting corpses. Those of you who follow Paul’s Art Thread, our Facebook or Twitter will already know – most of the visual makeover this week has been armor. We tried to give all the armor are more realistic and detailed appearance, but also a bit more of a used and less fresh look. Pieces of armor were extremely expensive in the middle ages and used for a long time, sometimes over several generations. At the same time we’re looking to make the progression in armor value something to be more visually recognizable. Heavy armor should look the part, which is why Heraldic Mail no longer has the highest armor value in the game but is now situated more closely by the other mail armors. We’ve also filled quite a few gaps in progression with entirely new armor and will shuffle values around a bit for everything. So… We will have Roman Orcs now? This is bound to get ugly. Good idea to shake “let the orcs come, until them we’ll throw as many bolts/arrows at them as humanly possible” approach a little. It certainly makes the kite shield much more important equipment when facing certain enemies/weapon and while thinking your tactics through. Sorry, don’t got – is the new armor mechanic on? if yes can we little more information and may be manual? New armor mechanic is not implemented yet. As stated before, lovely artwork! And I hope that ranged combat becomes more viable now. With every update im more and more impressed. SO impressed!!!!! I cant put it into words! Thanks guys for continuing to make my dream game a reality. Loving all the attention to detail! I like the general idea of used/”vintage” equipment, but please consider keeping new-looking stuff as well. That way, there’s more visual variety, and you don’t risk getting bogged down in over-the-top grittiness land. Grey and brown and gritty has been overused in videogames, IMHO. Also, there’s Darkest Dungeon as a sort-of related game at the moment, and I don’t feel like having to much overlap in artstyle is a good idea. Impressive progress. I really like the fact that there seems to be a strong vision for the game, and all the new mechanics, aesthetics and implemented suggestion are tailored to suit that vision. I can’t say I’m hyped, but instead generally confident this will be a strong game. Keep up the good work.